In times past I was the girl who cracked under pressure! When bills were due and I didn’t have the money to pay them…I cracked. When my baby started talking and calling for her daddy…I cracked. When I felt like I couldn’t handle the task placed in front of me…I cracked. Finally, I got tired of cracking and not being able to withstand the tests and trials I was having. The past few weeks I have had the privilege of coaching hurdles for my school track team. I will be the first to tell you I knew absolutely NOTHING about track. I stayed away from this sport growing up. One, it was outside. Two, there was TOO much running involved!!! I went into this job assignment knowing nothing, but God has taught me some things as I have opened my heart and mind to do what is uncomfortable. 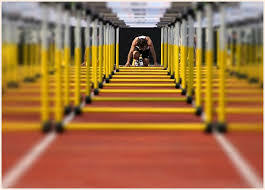 Hurdles are nothing but artificial barriers placed on a track…knowingly! Hurdles often trip my girls up because maybe their count is off, their form was wrong, or just plain old fear to step over it. Either way it goes, they know it’s coming. That’s the same way with our lives. We have hurdles! Jesus told us we would have hard times. He also told us to keep watch for the enemy as well because he is the ruler of this world (1 Pet. 5:8) looking for ways to trip us up. Therefore, we should train ourselves on how to combat our thoughts or feelings we get when hard times come! I have researched, not that I had much of a choice, what it would take to coach my girls over the hurdles and be successful in doing so. And everything I saw was pretty much the same: 8 steps to the first hurdle, 3 steps between hurdles thereafter, and (here’s my favorite) DON’T JUMP AROUND IT BUT STEP RIGHT OVER THE MIDDLE OF IT. Then there’s a such thing called the lead and trail leg. I interpret that by saying, “Put your best foot forward (lead leg) and don’t forget to land on solid ground (trail leg snaps over the hurdle)”. Learning these key steps have truly blessed my life! And most importantly, stay FOCUSED until you reach the finish line. Learning about the stride between hurdles has taught me perseverance. Hurdles are going to be present in our lives, but how we get over them is the key. Jumping over them leaves me in the air too long…but just stepping over them places my feet back on solid ground as quickly as possible! It’s the stride that helps me over. Keeping my mind stayed on the count [1, 2, 3…up (repeat until you reach the finish line)] keeps me focused. In my life, it’s the meditation of songs, scriptures, fellowship, and serving others. I do my best to combat those doubtful thoughts before and after they try to affect my walk with Christ! God has been developing my GODfidence in this matter. At times my girls get tripped up by the hurdle, and sometimes it knocks them down or causes them to stumble. First thing I say is, “GET UP. KEEP GOING. FINISH”. They have to realize the race is not over and that they need to finish. If I let them get into the habit of starting over, quitting, or even walking through the motions they won’t be making progress. We’ll be jumping over the same hurdles. Their confidence would be at a stand still and they wouldn’t be focused anymore! Awesome post. I needed to read this today as I’m in the middle of some real hurdles. Thanks!